Selling your home in the Canberra market can be a long and draining process. It takes a lot just to prepare your property for market listing. 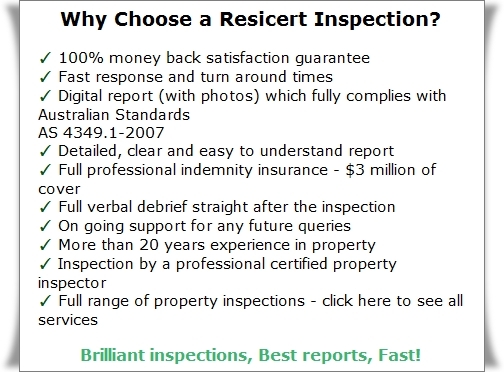 At Resicert, we take care of that process for you as we provide brilliant inspections, best reports and fast. You can be assured of this by using our building inspector Canberra services that are performed by the best building inspectors in the business. Resicert provides a complete package of all reports required to sell your home in Canberra. See our full service list. - Civil Law regulations (sale of residential property). "I really didn't think that there was a need to get a building inspection - because the home I was thinking about purchasing was only a few years old. Thanks to a co-worker's advice that it would be a mistake not to, I decided to have the building inspection performed. The Resicert Building Inspector's keen eye for detail brought to light many serious building flaws that I surely would not have been aware of otherwise. My advice from this great experience is - don't even think of purchasing a building without using the services of these guys first". There are many things to consider when buying a home. You need to know that it is safe, structurally sound and free from major or minor problems which are not easily visible. Our building inspector Canberra will provide you with a very comprehensive report once our building inspector has carried out his detailed inspection. You will know all of the important details concerning the integrity of the home. With this information and our answers to questions that you may have, you will be in a position to make the right decision. There are many things that you need to take into account when thinking about purchasing a home. Our responsibility is to make this process as easy as possible for you. Our Resicert building inspectors will conduct a detailed inspection report within 24 hours of the completed inspection. The report itself contains 16 or more pages of information detailing every aspect of the property - from the roof to the foundations. It is written in plain English, not building terms, making it easy for you to understand and utilise in the buying process. Included are also photos of areas requiring attention. The photos are used to highlight both minor and major issues in the home. Regardless of your purpose for investing in a property, your decision to buy should be an informed decision. It should be based on relevant information. One of our many happy clients said…. The Resicert building inspector in Canberra provided me with buying comfort I didn't even realise I needed. It wasn't until I received the detailed and informative building inspector's report with colour photos, that I realised just how many components there were in a home that needed inspecting. I was thrilled with the professionalism and detailed care that went into both the inspection and the report and was able to purchase my home fully confident I was making the right choice. We realize that questions relating to the information contained in the report will crop up even after the home has already been purchased. For this reason, we welcome the opportunity to make ourselves available to answer any queries you may have or to advise you on appropriate steps to take concerning matters that were outlined in our report. We do "Brilliant Inspections, Best Reports, Fast", and we are so confident with our service that we offer a 100% money back guarantee. You can't lose!